In March 2018 Trimetari Consulting LLC performed a measurement of the building of the Palace of Children’s Youth Creativity named after L.N. 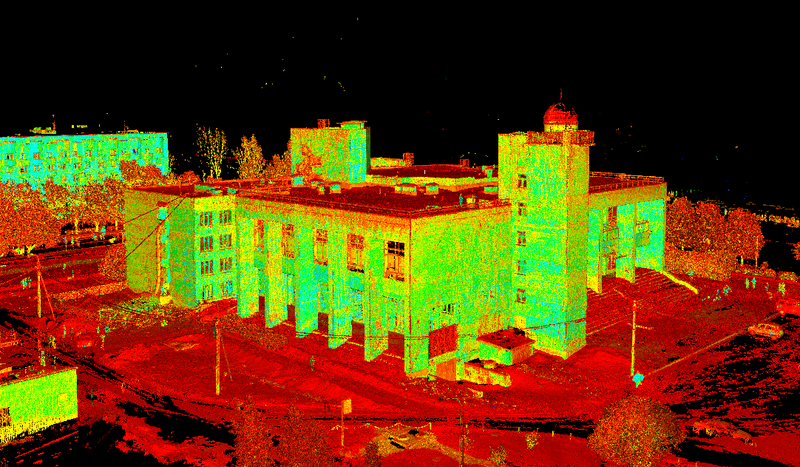 Maklakova in Kirishi, Russia by the method of ground-based laser scanning. To carry out total building renovation in 2017, design and estimate documentation was developed and passed the expertise. The power supply, heating, ventilation, sewerage systems will be completely replaced in the building, internal interiors will be updated. Among other things, it is necessary to mount a ventilated facade – rainscreen. One of the main drawbacks of a ventilated facade is the difficulty of mounting on insufficiently flat walls. The unevenness of the walls can often lead to the need to use non-standard elements when installing a ventilated facade. Eliminate the negative impact of uneven walls helps the competent design of the rainscreen, taking into account both the actual location of the daylight openings, balconies and other elements of the facade, and unevenness, incl. deviation from the vertical. To perform such a project, ones need an accurate and detailed measurement of the building – the facade and the roof. Laser scanning was performed to create a 3D model of building facades that takes into account all the unevenness of the walls. Subsequently, for this model, the design of the ventilated facade system was performed, which allowed to save money during the installation phase. Learn more about the project.